They can also be designed to be wall-mounted, freestanding, or inset into a worktop. Super-tough and durable, they are made to withstand impact and to last for decades, making them the economically-sound choice, as they will far outlast lower-quality products on the market. 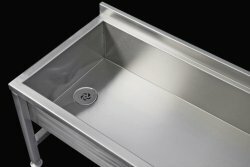 Fabricated from the highest-quality, 304-grade steel (316-grade for laboratories), our wash troughs meet all current Food Hygiene and Health & Safety regulations, making them ideal for use in any situation – from hand-washing in nurseries, businesses and domestic settings to washing-up facilities in food technology rooms and instrument cleaning in laboratories, hospitals and veterinary practices. These adaptable metal troughs can be made to virtually any continuous length (up to 3500mm), to fit an exact space. All boast a high-strength, boxed rim on all sides for strength and safety, with optional rear upstand/rear tap ledge. They also feature a waste with integral grate, to keep outlet pipes clear. specification of depth (200mm maximum at the deepest end is standard). 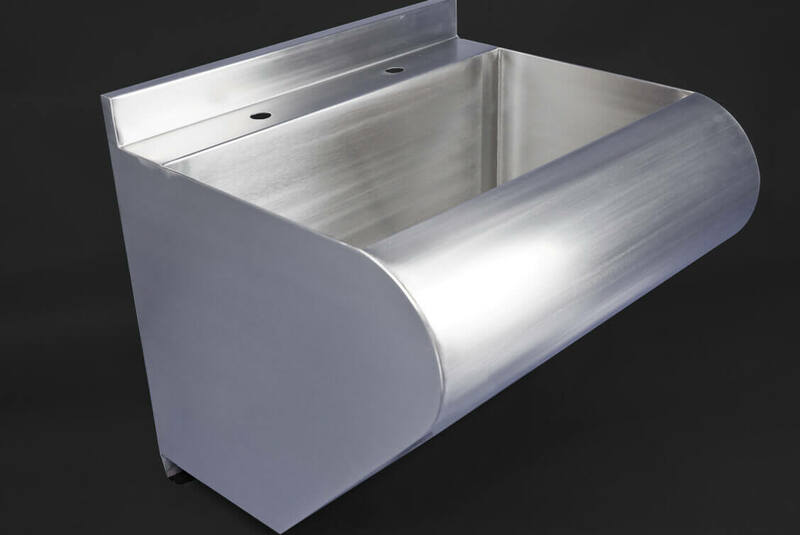 Whether you need a deep trough for the cleaning of equipment or a long unit for the washing of hands, our bespoke stainless-steel wash troughs can be made to fit the situation. Available in a choice of three models, these units are fabricated in our premium, 316, laboratory-grade steel, which offers the ultimate resistance to heat, impact and harsh chemicals. What’s more, they will last for decades, making them the cost-effective choice for your project. with central waste position (in smaller units), or with waste at the end of your choice in longer units. 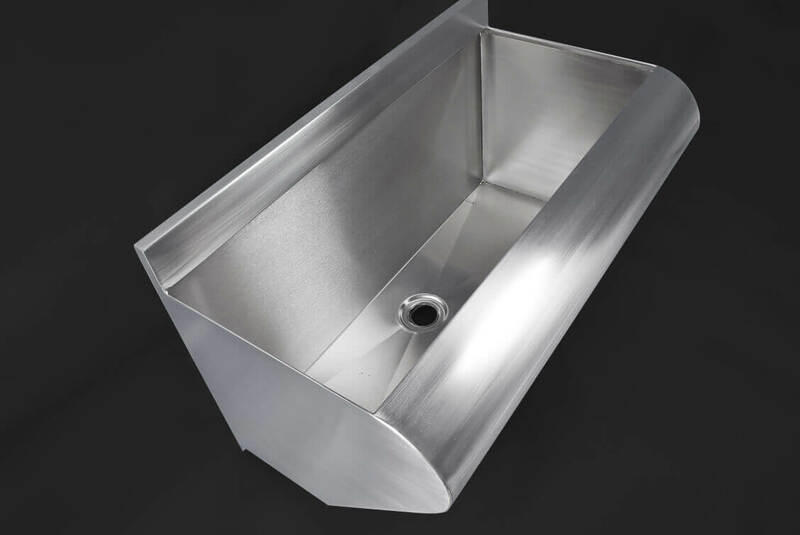 All wash troughs are supplied with a flush, grated waste, to ensure efficient drainage, and all feature a high-strength, boxed rim on all sides. We offer a wide range of other laboratory-specific items, all made from our premium, 316-grade stainless steel. These include: worktops, shower trays, fume cupboard liners, hand-wash basins and laboratory sinks. Contact us today, to find out how we can help to furnish your lab. 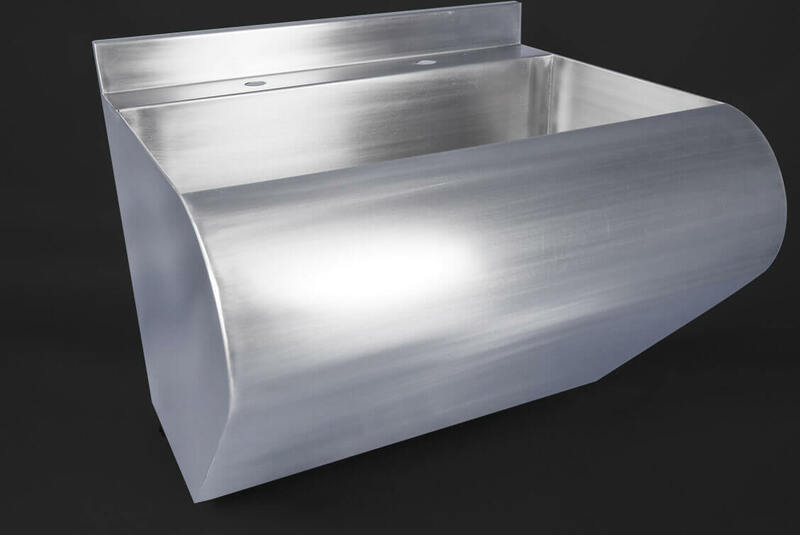 Our ultra-hygienic, stainless-steel wash troughs are fabricated from premium, 304, food-grade steel. This is the optimal material for a healthcare environment, as it features naturally antibacterial properties, which make it easy to maintain the stringent hygiene standards of your hospital, clinic, dental or medical practice or care home. The steel troughs comply with all current Health & Safety and Food Hygiene regulations, and are also resistant to impact, extremes of heat and harsh chemicals – meaning they will retain their low-maintenance, high-shine finish for decades. 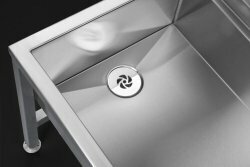 Each metal trough is fabricated to order – allowing you the flexibility to customise a unit to fit the situation and usage precisely. Whether you need an extra-long, continuous trough (up to 3500mm) or a model with a specific quantity or siting of tap holes, we can supply the end product to suit. choice of either-end waste placement in longer units (central siting in smaller models). All wash troughs are supplied with a flush waste, with a grate for efficient drainage. We have more than fifty years’ experience of supplying stainless-steel products to the healthcare sector, and can provide any items you need for your hospital, dental practice, care home or clinic. Take a look at our wide range of worktops, vanity tops, tables, trolleys and hand-wash basins, among others – or simply contact us today, to discuss your requirements. Our stainless-steel wash troughs combine practicality with ease of maintenance, making them the perfect solution for washrooms and kitchens in academic facilities. Designed for the washing of utensils or hands – but highly adaptable for any usage – these units are robust, impact-resistant and exceedingly durable. They are also naturally antibacterial, helping to keep germs to a minimum. Meeting all current Health & Safety and Food Hygiene regulations, the metal troughs are also impact-resistant and supremely durable – they will last for decades, making them the financially-sound choice for your institute. freestanding wash trough, with optional shelf beneath. For academic laboratories, choose our premium, 316-grade steel, which is resistant to extremes of heat and contact with harsh chemicals. Thanks to our fully bespoke service, you can order almost any length of continuous trough, up to 3500mm, to fit the available space exactly. You can also specify the siting and quantity of tap holes and (in longer units) the end at which you require the placement of waste outlets. Depth can be varied (200mm at deepest end is standard), and the internal sides can be sloping or vertical. All of our metal wash troughs come with a flush, grated waste, to allow efficient drainage. 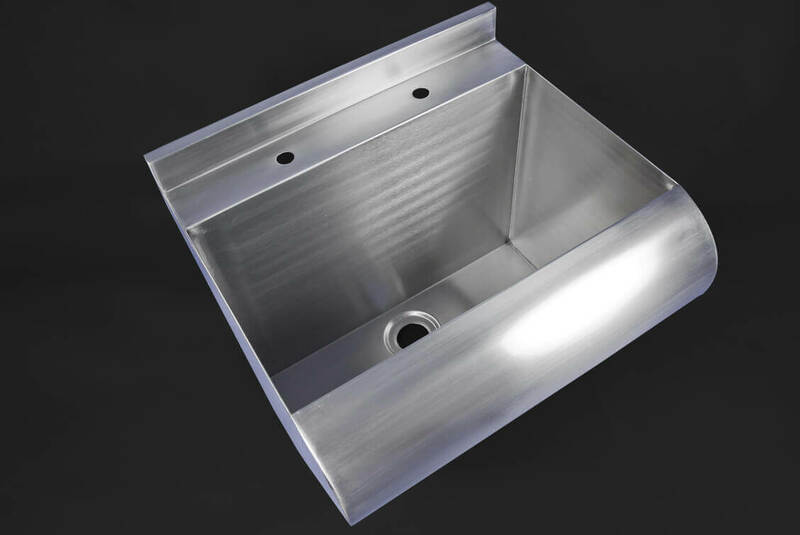 For a truly streamlined unit, consider a stainless-steel counter, into which an inset trough can be fully welded, for a seamless finish. This avoids having joins in which bacteria and food crumbs can gather. Such a high level of finish is not possible with any other worktop material, including Trespa. Take a look at our other products designed for use in universities and colleges, schools, preschools and nurseries. We offer worktops, shower trays, cupboards, shelving, basins, sinks and laboratory furniture, all meeting our high standards of finish and durability. Alternatively, call us today, to discuss your project. 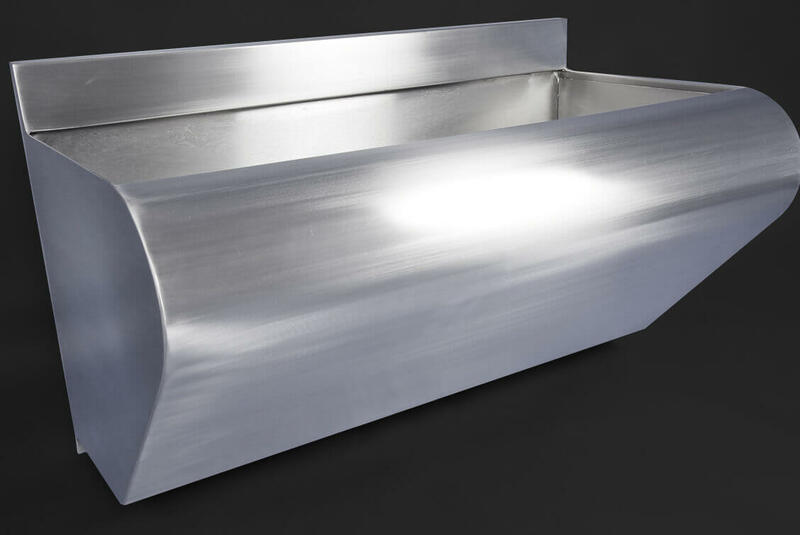 Designed for use in busy commercial kitchens, our robust stainless-steel wash troughs will last for decades. Fabricated from premium, 304, food-quality steel which meets all current Health & Safety and Food Hygiene regulations, they are highly resistant to impact and extremes of heat. This versatile metal also resists the adhesion of bacteria – making it the ultra-hygienic choice for a catering environment. Choose from a wall-mounted or freestanding unit, both featuring a high-strength boxed rim on all sides – or opt for an inset trough, designed to be set into a worktop. 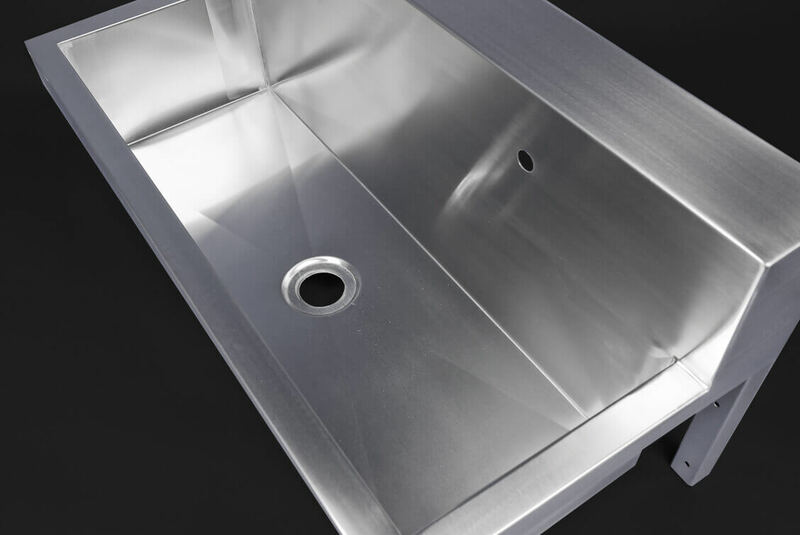 For the ultimate in hygiene and streamlining, choose to have your inset trough welded into one of our wide range of stainless-steel worktops: the fully-welded finish is entirely seamless, helping to maintain high levels of kitchen cleanliness. either-end waste placement in long units (central placement in shorter troughs). flush waste, with integral grate to keep outlets clear. At DSM, we are experienced suppliers to the catering industry. We offer a wide range of bespoke worktops, sinks, basins, preparation tables, trolleys, and entire kitchens, all designed to stand up for decades to the demanding environment of a busy kitchen. Contact us today, to discuss the exact requirements for your commercial catering business. At DSM, we understand the requirements of a high-traffic public or private washroom. 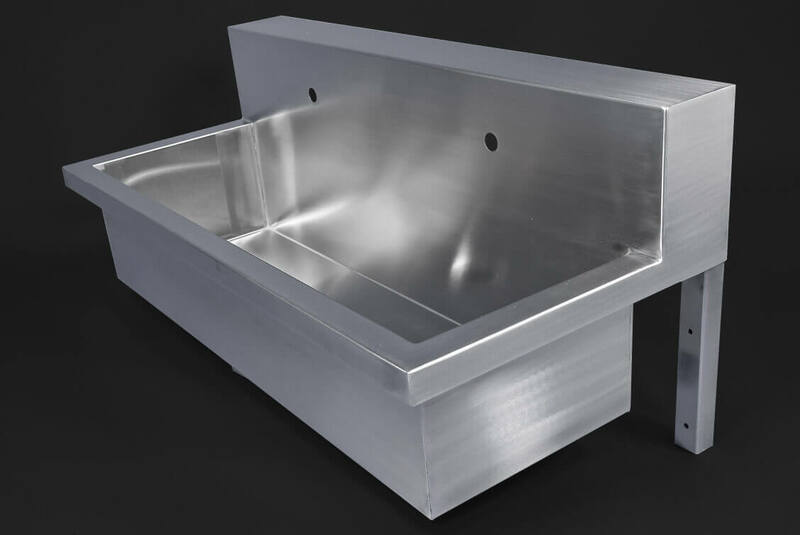 Our stainless-steel wash troughs are made to order, from premium 304, food-grade metal, which will stand up to the daily impact and potential rough treatment of a washroom environment. They are also highly antibacterial and low-maintenance, retaining their high-shine, virtually germ-free finish with the minimum of upkeep. freestanding, with optional built-under shelf. Each of these is fully customisable. Choose: any continuous length, up to 2500mm; any siting and quantity of tap holes; virtually any depth (standard depth at deepest point is 200mm). All models feature our boxed rim for strength and safety. As well as wash troughs, we offer many other items for washroom applications. Take a look at our range, which includes vanity tops and hand-wash basins; splashbacks, shower trays, urinals, cupboards (with optional locks) and shelves. Get in touch today, to discuss the requirements for your project. 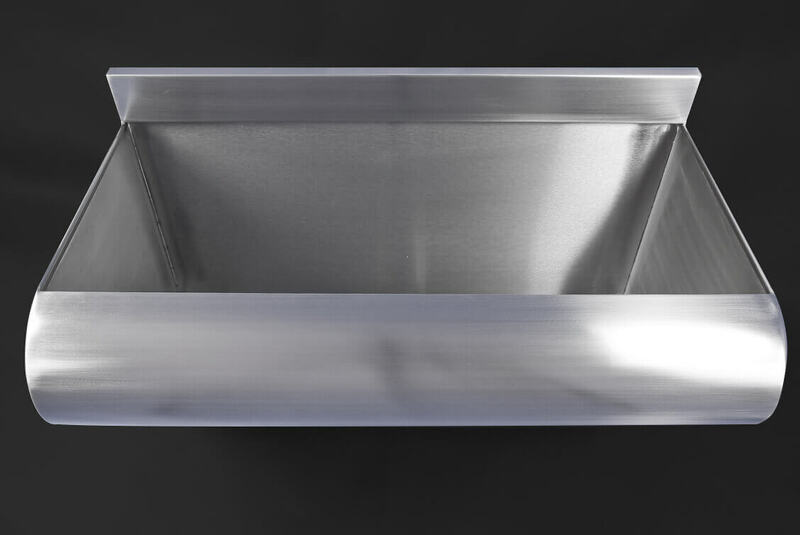 Our stainless-steel wash troughs are the perfect addition to your kitchen or utility room. Far more durable than the ubiquitous ceramic butler’s sinks (which are prone to cracking and chipping), our stylish metal troughs are ideal for washing off muddy wellingtons and walking boots – or dealing with dirty pets. What’s more, your trough’s attractive sheen will complement any contemporary room scheme and will require only the minimum of cleaning to keep it looking as good as new. Each of our wash troughs is fabricated entirely to order by skilled engineers in our Nottingham factory. You can specify the exact depth and width of item you require, to fit the space you have available. We can also make it to virtually any length, up to 3500mm. Choose between the space-saving, wall-mounted model (which features adjustable front legs); the freestanding design, which can be fabricated with a built-under shelf; and the inset trough – for inclusion within a worktop. For the sleekest finish with an inset unit, opt for one of our stainless-steel worktops. This will give a fully-welded, seamless finish – not possible with any other work-surface material. 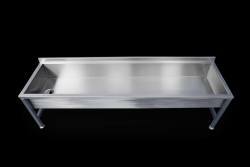 Fabricated from premium, food-grade steel, our troughs are resistant to impact and extremely durable. In fact, like all of DSM’s bespoke products for the home, we are so confident in the quality of our wash troughs that we include a twenty-five year warranty*. What’s more, the metal is the environmentally-friendly choice for your home: the raw sheet comprises around sixty per cent recycled materials, and the end product is entirely recyclable. We provide many other bespoke items, from cupboards and shelves to shower trays, hand-wash basins and sinks. Why not consider an entire kitchen in stainless steel? Made entirely to order, this is the height of chic, modern styling – and it will outlast all alternative materials. Our versatile, stainless-steel wash troughs really come into their own in a veterinary practice, where they can be used for washing hands, cleaning instruments, or sponging down patients. The boxed rim provides a super-strong, safe edge, ensuring there is no risk of injury. 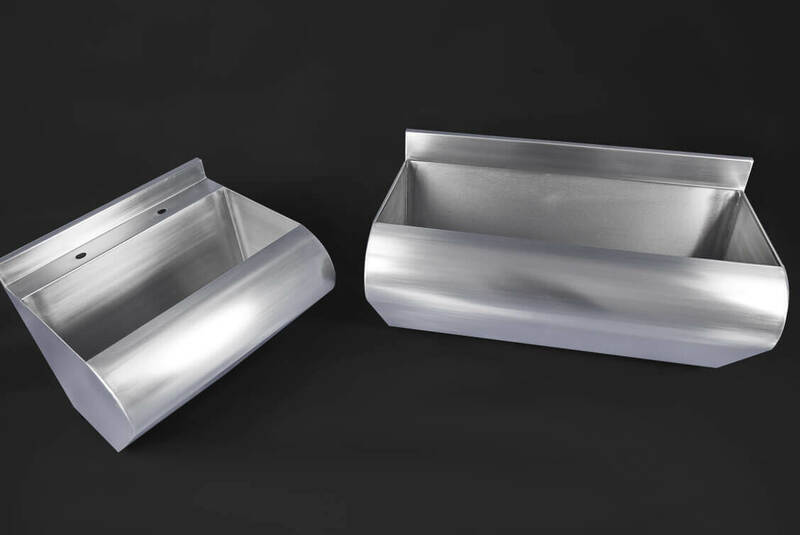 Fabricated from 304, food-grade metal, which is naturally antibacterial, these stainless-steel wash troughs are the most hygienic option for your practice. They are also the economically-sound option, as they are not only heat- and impact-resistant, but they will also last for decades. wall-mounted trough: with height-adjustable front legs for strength and levelling. Each of these designs can feature either straight or sloping internal sides, and all can have tap holes sited to order. They are supplied complete with a flush, grated waste, to ensure efficient drainage. In addition to these wash troughs, we offer a wide range of other items suitable for veterinary surgeries. 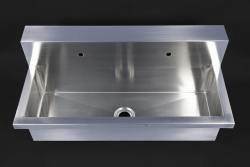 Take a look at our hand-wash basins; shower trays; laboratory sinks and slop hoppers/sluice sinks. Contact us today, to discuss the requirements for your practice.